Starring a water-soluble derivative of vitamin C, this brightening serum provides antioxidant protection to reduce signs of ageing and even out skin tone. 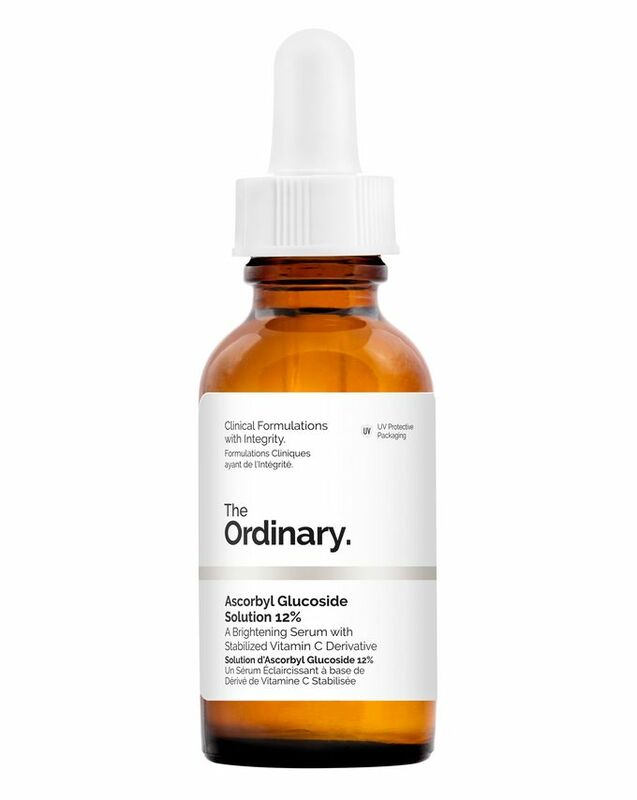 Ascorbyl glucoside is considered a gold standard of vitamin C derivatives, thanks to its high stability and comfortable effects – The Ordinary’s formulation is delivered as an easily applied serum for effortless use. Shown to offer specific skin-brightening benefits, The Ordinary’s Ascorbyl Glucoside Solution 12% consists of a water-soluble derivative of vitamin C. Though less potent than direct L-Ascorbic Acid, Ascorbyl glucoside offers high stability and comfortable use – this formulation is delivered as an effortlessly easy to use serum. In terms of effects, how do you like the sound of defence from free radical damage, even, radiant skin tone and diminished signs of ageing? Pretty difficult to resist! Just a few drops morning and night and you’re good to go. It makes my skin so much better. Love this. I have been using this product for a few months now... after listening to some advise on the internet I started using in the AM and the PM under the eye area ...this product has helped with the bags under the eyes, they look less puffy. SO happy with the results. Makes the skin feel super fresh! I love AGS and highly recommend it for a daily vit-C serum. Use this in my AM routine as it absorbs fast. Not a bad product although I think it would be more suitable to slightly oilier skin types as its a gel-like texture and dried to a sort of matt like the texture on my skin. I prefer the vit c 23% to this. I'll give the other vit c products a try, I won't be repurchasing this. It does help in giving me the glowing I always wanted. Recommended product. Haven’t really noticed anything yet, although it’s just been 2 weeks or so. I’ve tried using this in the morning beneath my sunscreen which is ok, but if I put liquid foundation on top it starts pilling on the skin which makes my morning skincare/makeup routine more time-consuming. I’m eyeing off the oil based vitamin c serum now as that should not cause this issue. I wish people would stop bashing this specific product for "rolling up". There are multiple forums, videos and articles about how to stop "piling" (yes people, the correct name for what is happening.) It is far less to do with the product itself and more to do with the amount you are using or the products you are using it with (i.e if you use something silicone heavy or at all with it - this can cause piling). Furthermore, the product is not intended to be used as the last step (i.e moisturiser should be applied on top) which is why it is sticky to the touch. Usually, the ingredients that prevent things being sticky are less beneficial to the skin and just add cost to the item. The ordinary do not use ingredients that they do not need to use. This product is amazing for skin brightening, perfecting skin texture and tone. Amazing to get a vit c product at this price. Goes on sticky similar to most hyaluronic serums but that feeling disappears after a few mins or moisturiser. The product is great. Looks my skin better. I really love it. It makes my skin looks so much better. I have been using this product for a couple of months now and absolutely love it. It transformed my skin. I used to get oily and dry patches on my face but this for some reason has relieved it?! It's also slowly brightening my skin which is what it's meant to do! I don't find it sticky and my skin absorbs it really easily. Ever since religiously using this in my routine, my skin is definitely brightening up. I use this after the glycolic acid 7%, noticing a nice change in my skin. Will repurchase. It really does ball up in small bits if you happen to touch your face after applying. The key is to apply a really tiny amount and spread it quickly. Not a case if you want to use a moisturizer or foundation on top. I didn't notice any great effect but it doesn't do any harm either. Retexturizing overnight, but still too sticky!! Bought this on a whim as I don’t have issues with discolouration, however, this product was more effective at refining skin texture overnight and helping control a spot than the 2% retinoid serum from the same brand. Unexpected! Reach for it a lot. Knocked a star off because it’s so goddamn sticky and balls up like anything (by that I mean when you use moisturiser or makeup on top and you get the little rolled gluey bits in case that sounded ruder than I intended). 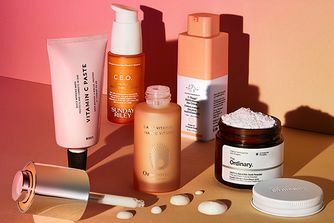 I don’t expect anything from this budget brand to have perfect texture or performance though, I just expect it to very basically take care of the skin of people with low incomes (was particularly special to me, a skincare nut, when a period of severe illness forced me to live off an income of £5k).